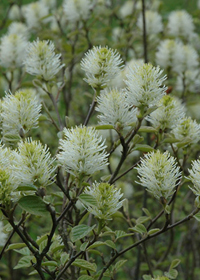 A true 3 season rounded shrub bearing honey-scented white bottle-brush flowers in spring before the leaves emerge. Its brilliant fall color remains longer and later than its cousins, holding its strong orange, red, and yellow tones into late November or even early December. More tolerant of full sun than others in it genus.